The Lake Country Chamber of Commerce Business Excellence Awards is proud to be celebrating our 16th Anniversary. 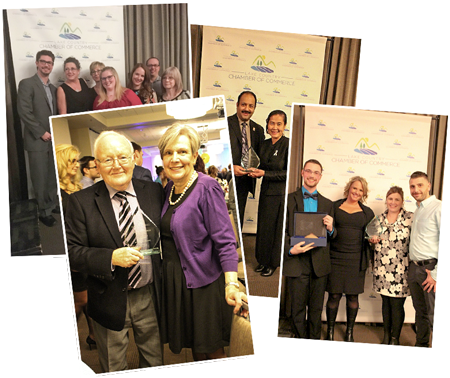 Long considered to be the premiere business event of the year, the Business Excellence Awards are a high profile, prestigious accomplishment for Lake Country businesses. Please nominate a deserving business for an award, nominate multiple businesses for awards or nominate a business for multiple awards. Check below for eligibility information. Tickets for this great event are will be available at the Lake Country Chamber office closer to the date of the event. Please watch for updates regarding details. Congratulations to our 2017 BEA winners! Nominate a business or individual in Lake Country by visiting the Lake Country Chamber of Commerce website. Judges will review the submissions and choose the top 3 finalist in each category. Finalists will be selected based on the information and comments submitted. Let’s Celebrate! Join us at our Annual Christmas Party on December 13, 2018 when we reveal the TOP 3 FINALISTS in each category! Tickets can be purchased on the Lake Country Chamber website under Events. If you were selected as a top finalist you will receive a Finalist Package by December 25, 2018 that you will need to complete for the judges review in late January 2019. Finalists will need to submit their package to the judges no later than January 25, 2019. During this time there will be a second opportunity for you to support the finalists through our website! Winners will be announced at our Business Excellence Awards Gala on February 22, 2019. Last year this event SOLD OUT with 210 guests in attendance! Sponsor a tables at the Gala! Decorate a table to represent your business. Examples: centerpiece, table linen, chair covers, brochures or business cards at each table setting. NOTE: No large items are allowed such as balloons. Thank you to our Partner Sponsors! Past Year’s award Recipients may not be nominated in the same category for one year following their win, but can be nominated and win in other categories.